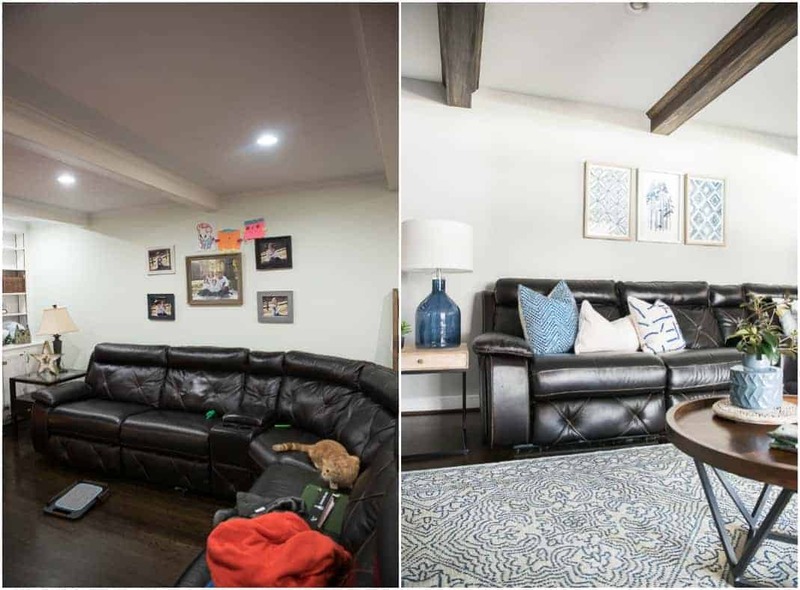 Neutral Living room makeover: Check out this clients beautiful new space! Well! I have been decorating my own house for the last 5-6 years, and at the end of last year I took on my first client’s project. 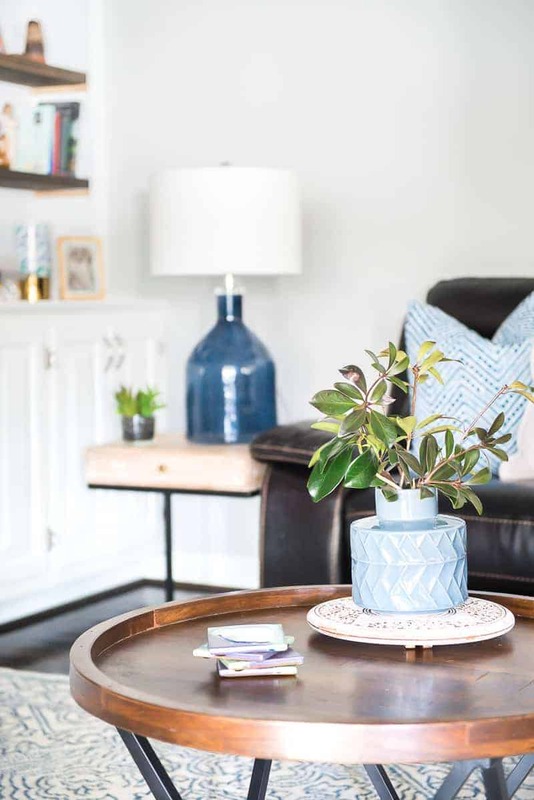 I’m super excited to share the details with you guys of my client’s new neutral living room update today. I have known this sweet family since my oldest kid went to preschool which has been a few years already. It’s funny how you form relationships with your kid’s peers parents. 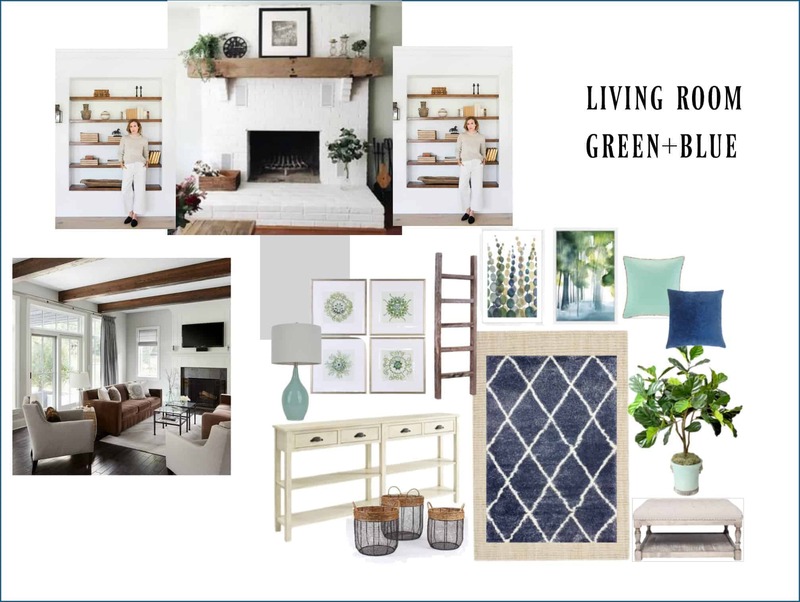 So anyway, the mom reached out to me and said that she has been following my blog and she loves my decor style, and she would love to have my ideas for her living room update as she was just busy with work and did not have a design plan on her own. We set up our initial meeting, and we had a little chat about what I would envision and her priorities in her space. As soon as I walked into her living room, my brain immediately started rolling, and the ideas started coming. Below is a picture I took when I first went to her house so you can see what we started with. The living room definitely needed some love and personality. I know we can get busy with our lives, and we all juggle life and work, but I think it’s important to get home after a long day and enjoy our home and atmosphere. 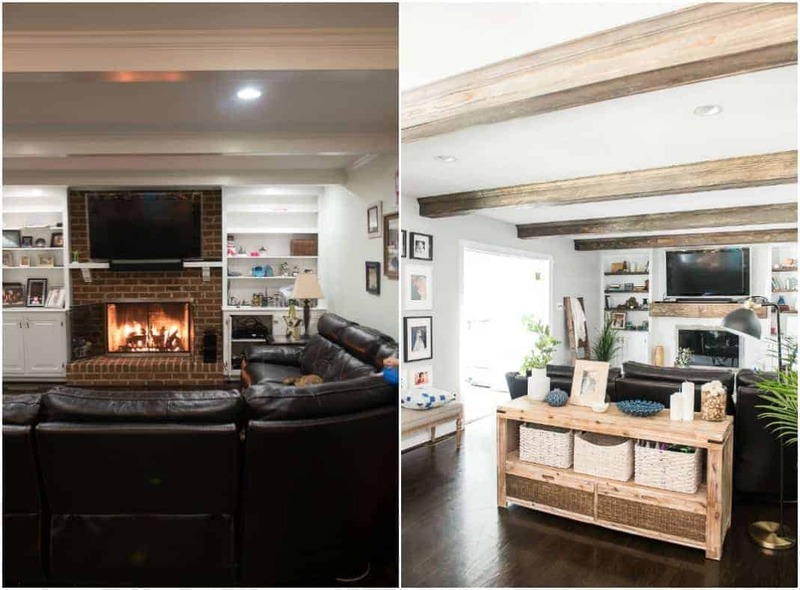 The family didn’t want to invest in lots of new furniture, such as a couch and more significant renovations but they had a budget to add smaller pieces to bring this space to back to life. After our initial consultation, I set down and provided my client with three mood boards based on her requests and my ideas. My client was leaning towards to the blue hues, and natural color pallet which are super easy to work with and those are my favorite colors as well so I was all over that! 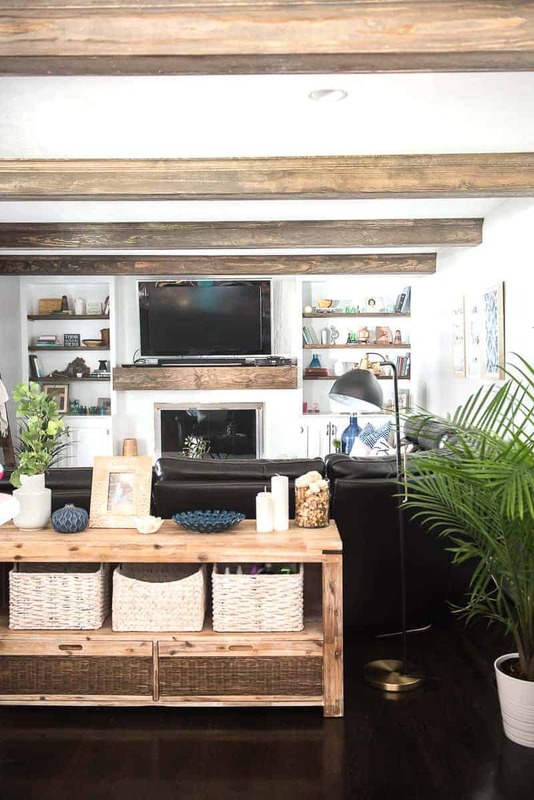 We found some pieces online that we added to this living room and did our best to support our local shops too. 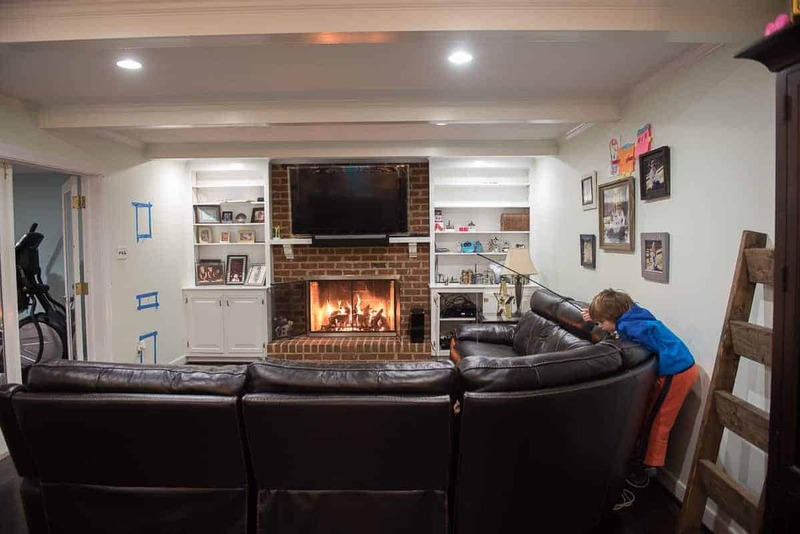 We didn’t need to hire contractors to do the painting jobs as my client’s husband is a contractor so that’s awesome and we saved a lot on their budget that way. 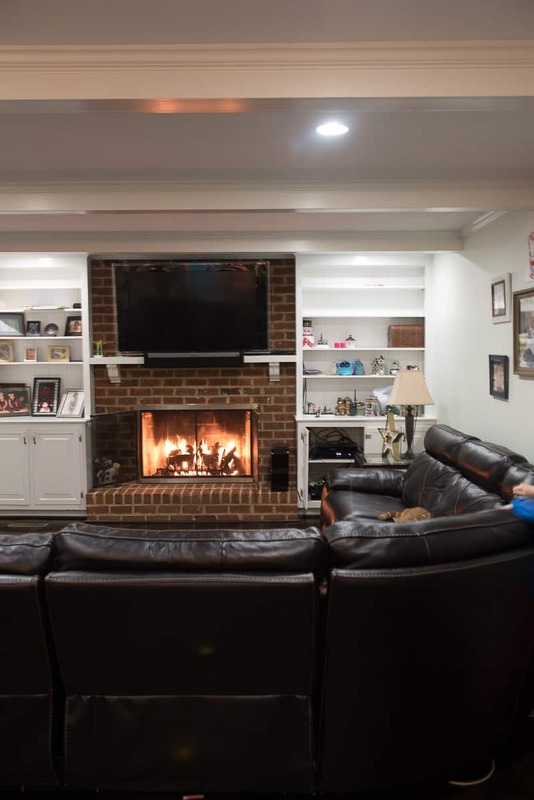 I recommended painting the brick fireplace and the beams plus we also decided to add a nice chunky mantel to the fireplace. 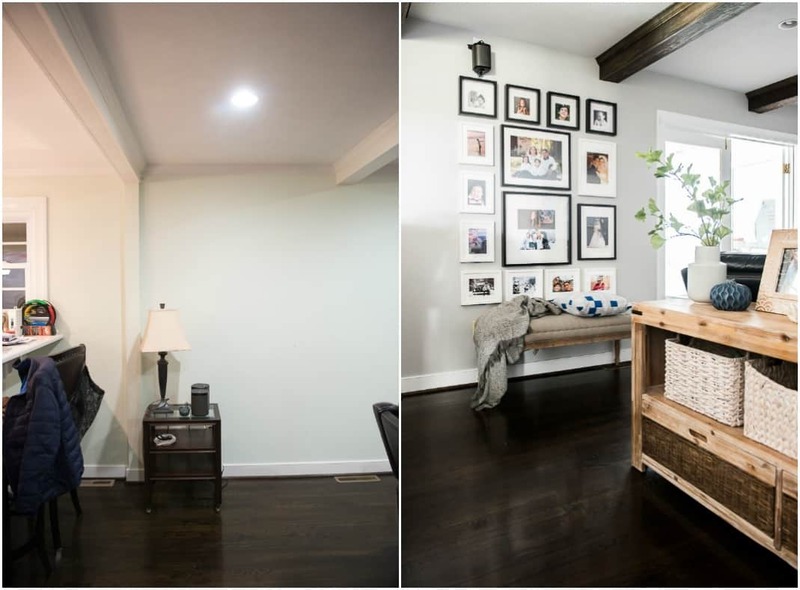 My favorite part of this makeover was adding this fantastic, personalized gallery wall. It’s just stunning and I think everyone needs a great family wall. Just last week I was reminded what gift it is – each day we have – and not to take it for granted. Show off your silly pictures, travel if you can, hug your kids, take chances and spend more time with your loved ones! 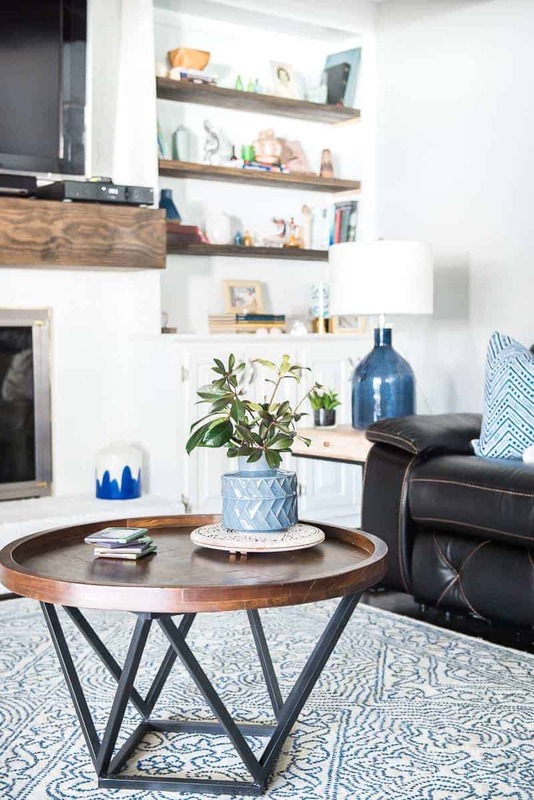 I found this GHAW-JUSSS console table at Home Goods, and I immediately knew that it would be the perfect piece to bring in some lighter, natural color against that dark couch. 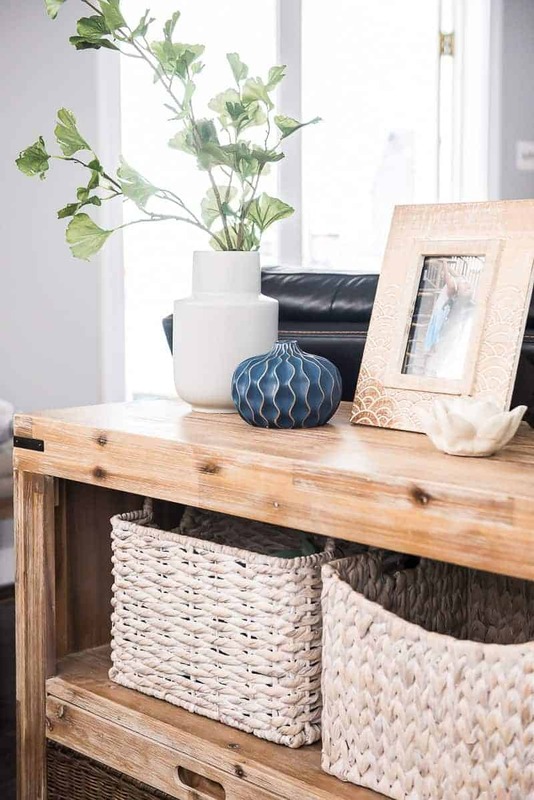 We utilized that console table with baskets that also helped to bring more texture to the space. I added lots of blues but I think it blends in well with the darker brown hues. Adding a few greens (faux and real) helped to feel the room airy and bring in some life. What do you think? If you are local and need some design help, I would love to step in and help you with your needs! Be sure to email me or find me on Instagram (place_ofmy_taste) and we’ll get the ball rolling! If you are not local and would still love to get some design help, visit my E-design page and learn more about my services! Pin it now to reflect on later and share this new fresh look with your friends. Hope you enjoy this and my other designs- leave me a comment and let me know what you like. 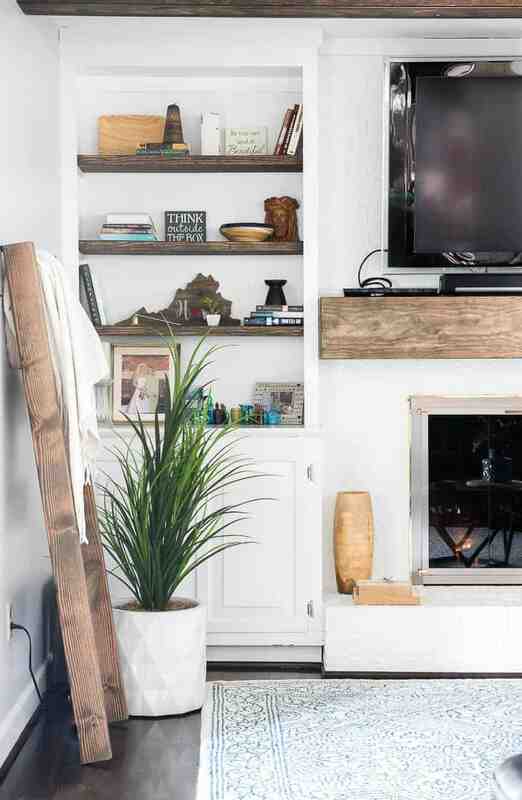 « SPRING MANTEL DECOR – BOHO IT UP! So gorgeous!! 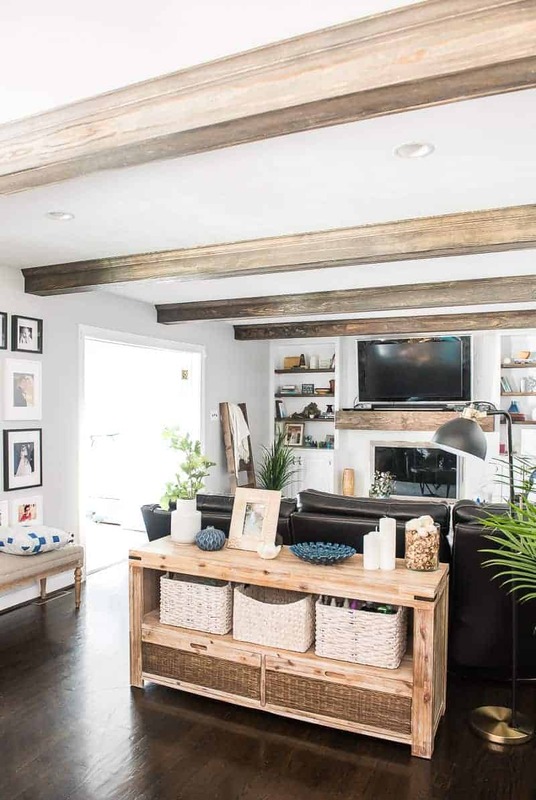 Would you talk more about the beams? Did they add wood over the existing? What a great transformation – beautiful! Aniko this is absolutely stunning and a great way to show others that having a brown leather sofa isn’t the end all be all. 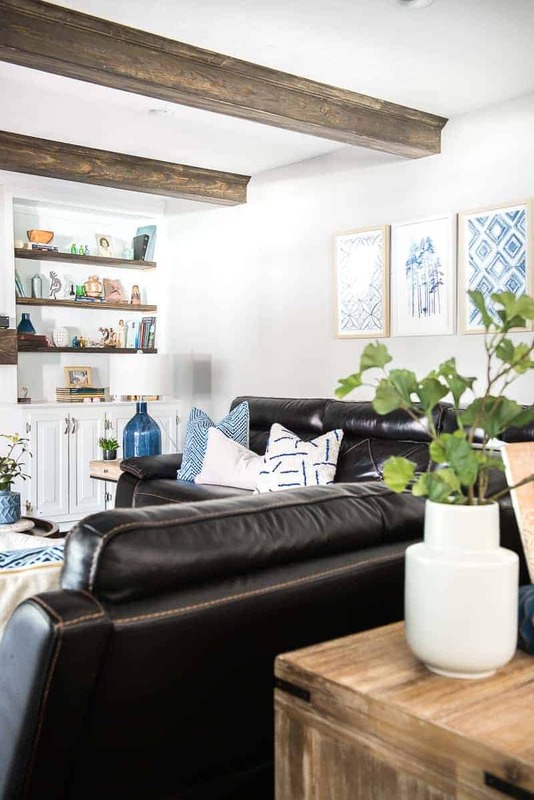 I love the wood tones mixed with the blues and greenery, Great job! 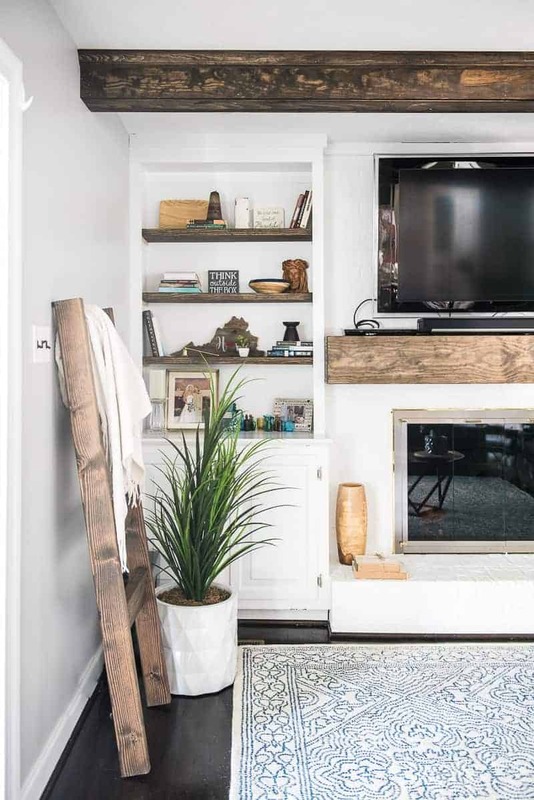 May I ask where did the beautiful white/blue rug came from? 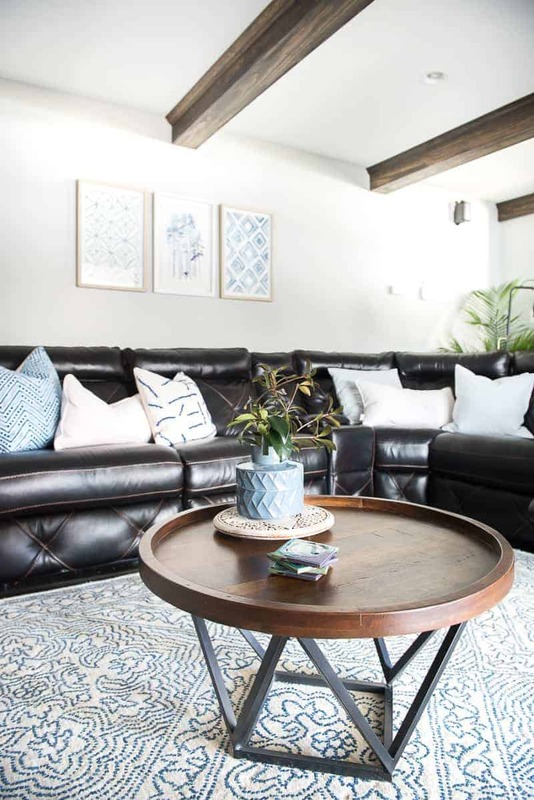 The blue rug was purchased at at local retailer. I am not sure if you can find it online. Thanks so much! Aloha!